He's half man, half beer keg. He swings a mean bat, and if you get thirsty there's a tapper protruding from the back of his head. 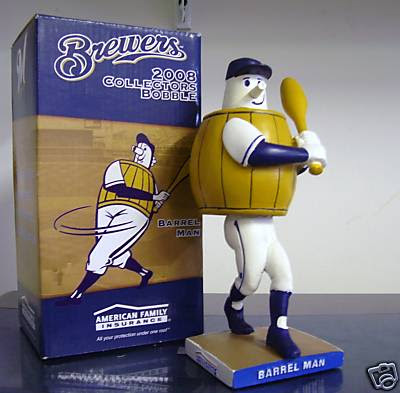 He's Barrel Man, an apt symbol of baseball in Milwaukee. And he's older than he looks. Paul Tenpenny, who for months has been researching the origin of the image, found him featured first in a cartoon from the Milwaukee Sentinel in 1901, a time when excitement was building about the city landing the American Association league Brewers for the coming season. The caption is: "Brewers to Detroit - You just wait till my 'pitchers' get to 'working.' " The cartoon shows Detroit players tapping beer from the Brewers' Barrel Man into pitchers and drinking themselves into loopiness. This particular Barrel Man has the tapper in, um, the front. "When I showed people the 1901 one, they said it's almost not decent enough to print, considering where they have the spigot coming out," Tenpenny laughed. 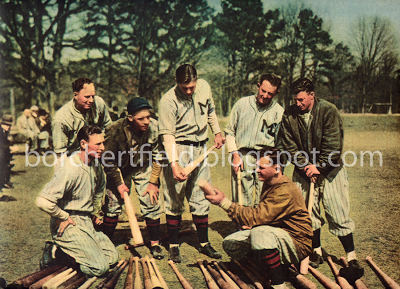 With the new baseball season about to start, Tenpenny has written an article on Barrel Man, filled with photos, that will run soon on mearsonline.com, the Web site of Memorabilia Evaluation and Research Services for sports collectors. A Milwaukeean and a county retiree, Tenpenny, 56, works part time for the site. He's a longtime baseball fan with fond memories of walking with his dad to County Stadium for games. Over the years, the Barrel Man has become a familiar, if no longer heavily used, image connected with our major league Brewers. "Most fans, including myself, had no idea that his history predated the current Milwaukee Brewer team. A closer look back in history shows us where he came from," Tenpenny writes in the article. 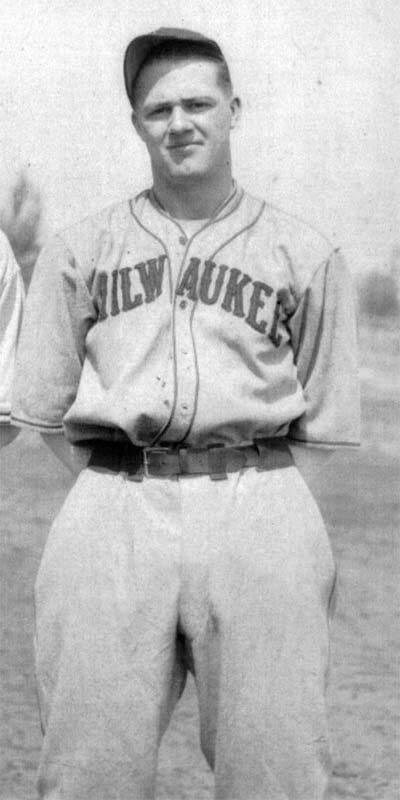 Despite a few newspaper cartoons from early in the 20th century, Tenpenny couldn't find evidence that the mascot was used officially by the minor league Brewers until the 1940s. He discovered that the Milwaukee Journal at that time credited Rudie Schaffer, Brewers general manager, with creating the Barrel Man and rolling him out in 1942 at Borchert Field at 7th and Chambers streets. Charlie Grimm poses with Barrel Man in 1942. At the time Barrel Man went by the name 'Owgust' — pronounced Awgoost. The character's name then was the very German Owgust, which was pronounced and sometimes spelled as Awgoost, Tenpenny said. 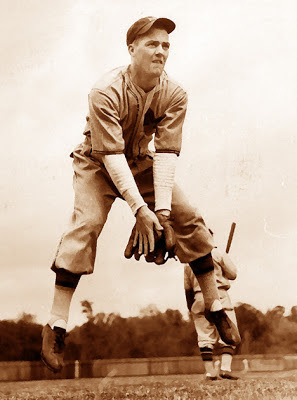 Owgust - batting (righty and lefty), fielding and even sliding into base - graced the covers of many scorecards and programs and was on the players' warm-up jackets. Later in the 1940s, there was a younger barrel kid, which probably wouldn't fly today unless it was a root beer barrel. In 1953, Milwaukee landed the big-league Braves from Boston. 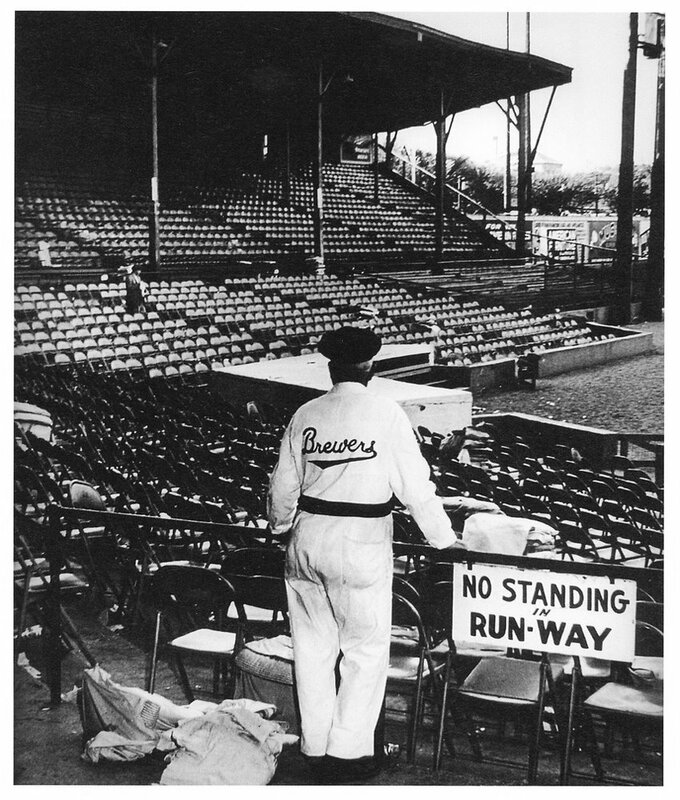 The suddenly irrelevant Barrel Man went on hiatus until the Braves left town for Atlanta after the 1965 season. But the half-human keg hadn't gone away. In 1970, baseball returned to Milwaukee, and guess who came along. "We chose the Brewers name and the Barrel Man because of my great and very fond memories of the AAA Milwaukee Brewers," Tenpenny quotes former Brewers owner Bud Selig as saying. 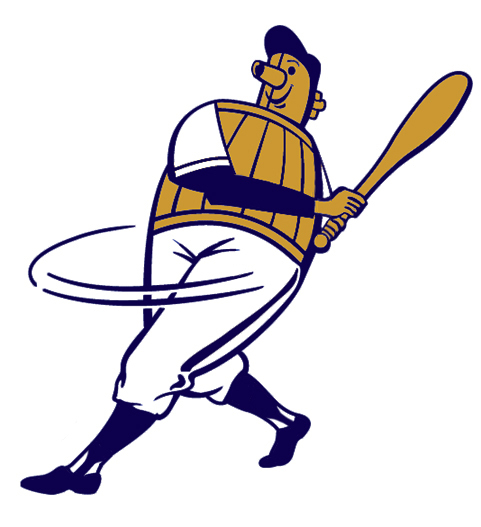 The Owgust name was dropped, but Selig's batting version of the Barrel Man was virtually identical to one used on the cover of a 1947 program of the minor-league Brewers. 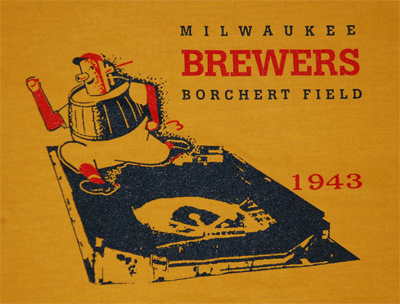 The modern-day Brewers made the Barrel Man an official logo and slapped him on programs, pennants, seat cushions, pins, you name it. Last summer, the team featured the character on a bobble head. 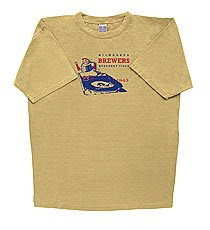 In 1999, for one game billed as "Turn Ahead the Clock," the Brewers ironically wore the old Barrel Man on their chests on some funky-looking jerseys. As far as Tenpenny could find, this was the only time the character made it onto the players' shirts. He plans to ask the team to consider adding him to the team uniform. When I raised the issue, Tenpenny said he didn't think it would be seen as an objectionable drinking image. "We're called the Brewers, so it's sort of like we have it out there anyway. The name is there, and we don't brew tea." The Barrel Man was used less after the 1978 season. Bernie Brewer gets top billing now, but Barrel Man still lurks at Miller Park. "We have a good amount of Barrel Man products on order, and it should be in very soon," said Brewers spokesman Tyler Barnes. They include shirts, caps and plush Barrel Man toys. It's a cask of characters that tie baseball in Milwaukee to its glorious past. That last bit its excellent news - I've wanted BBM merchandise for years. I emailed Stingl with my bobble head graphic story, and he was kind enough to put me in touch with Paul Tenpenny. Great to connect with someone else interested in keeping the city's baseball legacy alive. Tenpenny's article, mentioned in the JSOnline story, is here. Great stuff. If the Reds can do it, if the Padres and A's and Orioles can do it, why not the Brewers? That Padres jersey gives me an idea - next season is the team's 30th Anniversary - the perfect time to recognize the city's baseball history. This photo is one of the more commonly-reproduced Borchert Field pictures. There's something very melancholy about it, with the usher (in his peaked cap and team coveralls!) looking away from us, past all those empty stands towards the field. I guess that's fitting, for a departed ballpark. You can see the unique angled dugout, and that most of the "good seats" were metal folding chairs. Yikes. I don't have any context for the photo. 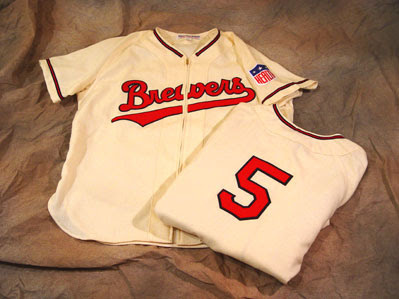 The "Brewers" script seems to indicate the 1940s, as they were using a Braves-inspired wordmark by the 1950s. 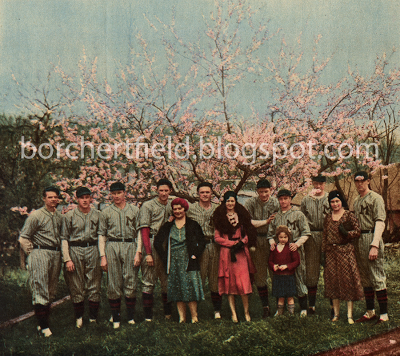 I hope someday we learn when it was taken, and the name of the lonely figure all alone in the Orchard. Although MLB has licensed the Milwaukee Braves quite aggressively, their minor-league predecessors have no such advocate, and so the potential to merchandise the AA Brewers has gone largely unmined. In light of the wonderful graphics used by the team, that's a shame. There is one notable exception - Ebbets Field Flannels, an amazing company based out of Seattle. They make Turn Back the Clock uniforms for major league clubs, and sell reproductions to fans. 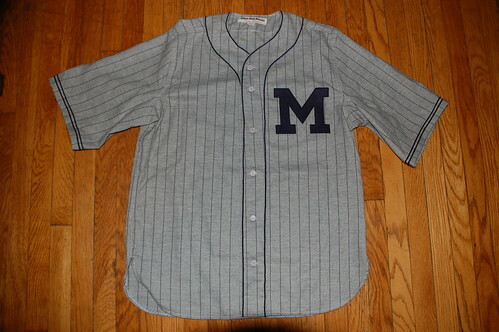 Gorgeous off-white wool with classic wordmark and piping, "HEALTH" patch worn by Major and Minor League clubs in 1942. Very, very cool stuff. You can buy both of them here. They came through with flying colors. 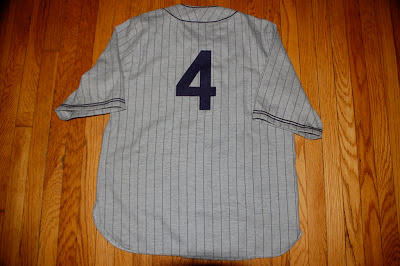 All baseball fans should be supporting Ebbets Field Flannels - they're the good guys. Not to mention that the more Brewers gear we buy from them, the more they'll offer in the future. 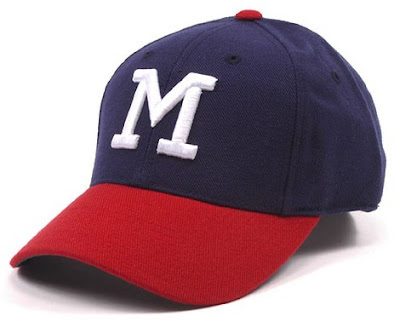 Sure, they say it's a 1953-1965 Milwaukee Braves cap. But we know better - before the Braves came to town, the Brewers wore this cap proudly. An unstructured version from Twins Enterprise is also available from time to time, but isn't on the site at the moment - I'll update when it becomes available. I have heard that there are Milwaukee companies which may sell AA Brewers gear - if anybody's aware of one, let me know. As you can see, they came through with flying colors. I can't wait to wear it to Miller Park. This was originally posted on my Packers Uniforms blog, but I thought seeing as how I'm starting a Borchert Field memorial, it could stand to be repeated here. On July 6th, 2008, the Brewers ran a stadium give-away promotion for their game against Pittsburgh. All fans received "a collectible Brewers bobblehead doll, featuring the Brewers Barrel Man, which was the logo of the Brewers from 1970-1977." 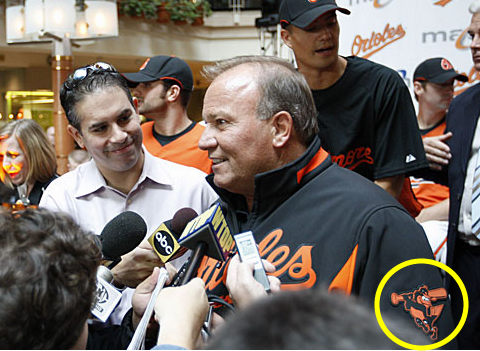 I was pretty excited when I first read mention of this, because I've long been a fan of the Beer Barrel Man logo. 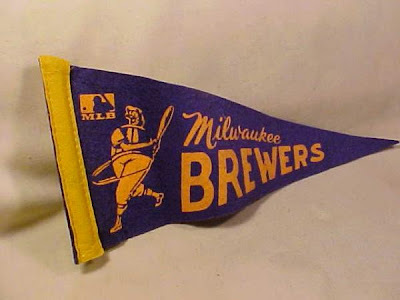 In the 1980s, when all my friends were Ball-and-Glove mad, I brought my tattered 1970s pennant to County Stadium. Heck, my very first tentative step into the InterWeb was a fan page for the guy, extolling his virtues (painful to look at now, but I haven't the heart to take it down, even if I still had the account password). I taught myself Illustrator by tracing a vector version of the BBM and updating him for the 1990s(! 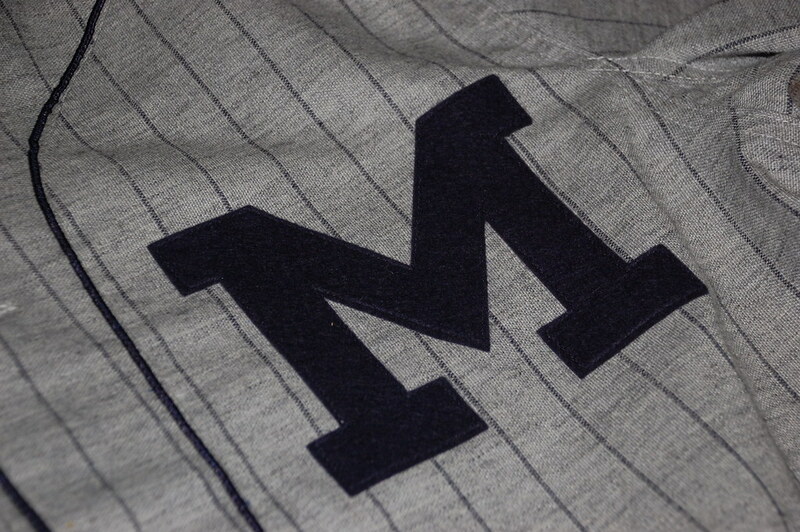 ), swapping his 1940s striped socks for proper stirrups and giving him the modern navy and gold color scheme. 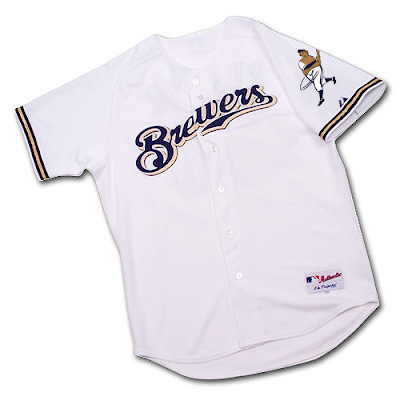 "Could we someday see the Brewers take the field wearing him on their sleeves?" I sure hoped so. I had written to the Brewers to bring the Beer Barrel Man back as a sleeve patch on a couple occassions, once right after the announcement that the Brewers would be moving to the National League (no reply to my letter), and once in 2003 to Ulice Payne himself (right before they sent him packing, so no great surprise that one went similarly unanswered). The BBM had been sadly neglected in the retro craze. On the one hand, I can understand this because the Ball-and-Glove is so iconic in the city, and to most fans the BBM stands for the first few years of the team, and some pretty lousy baseball at that. But what most fans don't seem to realize is that the BBM goes back farther than that - decades, to minor league ball (pretty good baseball, even), Casey Stengel, Bill Veeck, Borchert Field, back when his name was Owgust and he not only batted but was seen playing every position on the field. When Bud Selig needed a symbol for his quest to bring Milwaukee back into the bigs after the Braves left in 1966, he chose the Beer Barrel Man. 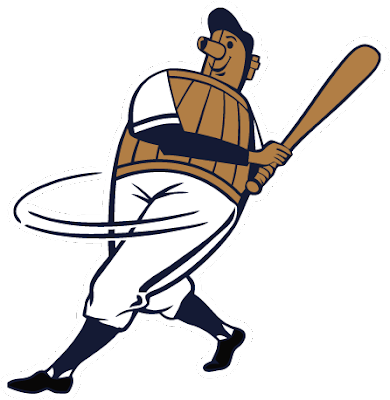 He was the logo when Hank Aaron came back from his Georgian exile. Robin Yount, Gorman Thomas, Cecil Cooper and Jim Ganter's names were first published in Brewer programs with the Beer Barrel Man on the cover. But memories are sadly short at times. You can't buy a t-shirt with the BBM on it, so he never really existed. So, as you might realize by now, I'm kinda the natural audience for this promotion. Just as my Packers collection stops after 1949, my Brewers collection skews very heavily to pre-1978 (if not pre-1953). Now, I haven't lived in Milwaukee for over a decade. I wasn't able to get to the game either to watch the Brewers pound the Pirates or to collect my bobblehead, but through the miracle of eBay I was able to secure one for my shelf. What stunned me when I opened my eBay shipment was not the whimsical and wonderful bobble, but the box. That's my graphic! Somebody in the Brewers' design office had obviously stumbled upon my site, and rather than make a bobble head doll faithful to the Beer Barrel Man logo actually used from 1970-1977, they made one based on my update. Extremely cool. Now, this isn't just my ego looking for similarities I know that's my Illustrator graphic for one simple reason - I put his stirrups on backwards. Rose goes in the front, big guy, and when wearing stirrups the large hole goes over the heel. Paul Lukas, I'm so ashamed.